1880: Archbishop Patrick A. Feehan (1829–1902), becomes the fifth Bishop and first Archbishop of Chicago serving between 1880 and 1902, during which the church in Chicago was elevated to an archdiocese. 1883: Hegewisch is founded by Adolph Hegewisch. 1886: Daniel Webster School is founded. It is the first public school in Hegewisch. 1888: The Hegewisch Opera house on 133rd and Erie (now Baltimore) opens. 1889: Hegewisch becomes part of Chicago. 1893: Fr. Franciszek M. Wojtalewicz begins serving the pastoral needs of the Hegewisch Polish community. 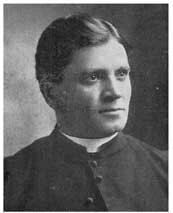 1896: Father Franciszek Krul becomes the first permanent pastor of the Polish Community in Hegewisch. 1900: Archbishop Feehan appoints Father Florian Chodniewicz as pastor to the Polish Community of Hegewisch with instructions to establish a parish for the community. 1902: The Polish community of Hegewisch approaches Father Florian about their desire for their own church. 1904: The Chicago & Indiana Air Line Railway becomes the Chicago, Lake Shore & South Bend Railway forerunner of the South Shore Line. Despite the name, the rail line does not go all the way to Chicago. 1905: October 2, 1905 St. Florian Parish is founded. There is still no rail service linking Hegewisch directly to the rest of Chicago. Streets are still dirt or gravel. Most of Hegewisch north of 130th street is still wetlands. 1907: St. Florian School building is finished and the first class begins in the fall of 1907. The original building is now Konsowski Hall. 1908: The Franciscan Sisters of Chicago arrive at St. Florian to serve and teach children of the parish. 1909: The Chicago, Lake Shore & South Bend Railway can travel as far as Pullman where people must transfer at Kensington in order to travel to down town Chicago. 1912: The St. Florian Rectory located at 13145 Houston is completed. The building remains in use to this day. 1912: United States Rolling Stock Company becomes Western Steel Car & Foundry. .
1916: A two-story frame house located on Baltimore Avenue is remodeled and is used for a convent for the Franciscan Sisters teaching at the school. The building will be demolished when the new present day school is built. The original convent was located in the vicinity of the present church/school parking lot. 1917: Daniel Webster School burns to the ground. A new school is built in the same vicinity and is renamed Henry Clay School. 1922: Father Florian is murdered on January 22. 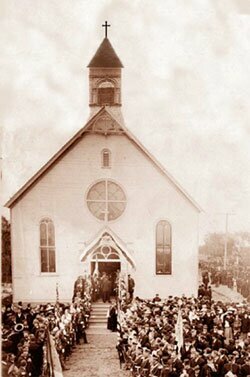 1922: Father Nowicki is appointed pastor of St. Florian on March 18. 1922: The Calumet Lumber Company opens in Hegewisch. It remains the only operating lumber mill in Chicago. 1922: The Cal-Sag Channel is completed. It serves as a channel between the Little Calumet River and the Chicago Sanitary and Ship Canal. 1924: The Ford Motor Company Chicago Assembly Plant opens on March 3. It remains the longest continually operated assembly plant owned by Ford. During World War II, the company built M8 Greyhound and M20 Armored Utility Car armored cars for the war effort. 1924: The crime of the century: Nathan Leopold and Richard Loeb, both 19, murdered their cousin Bobby Franks, hiding the body near Wolf Lake. 1925: On June 23rd, the Chicago South Shore & South Bend Railroad incorporated and on June 29th buys CLS&SB for $6,474,843. The train line is switched from AC to DC power making it compatible with the IC train lines and capable of travel all the way to downtown. 1926: First through electric train from South Bend to Chicago! CSS&SB running 56 trains daily including 21 limited trains. There is no stop in Hegewisch, however. 1927: Ground is broken for a New St. Florian Church building on October 16. 1927: On October 16, the “church of brick”, the present day St. Florian Church, is dedicated. The new building houses the Church on the ground floor and additional schoolrooms above the church. The original 1905 church building is converted into a social center. 1928: With a new South Shore Freight Station stop, Hegewisch becomes the first stop as the trains of the CSS&SB enter Chicago. 1930: St. Florian celebrates its 25th anniversary. 1933: On May 27, 1933, the "Century of Progress" World's Fair opens in Chicago. The theme of the exposition is the progress of civilization during the century of Chicago's corporate existence. It's the first time in American history that an international fair pays for itself. 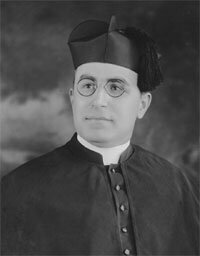 1934: Father Francis A. Kulinski is appointed pastor of St. Florian. 1934: Mann Park Field House opens and the park is officially part of the Chicago Park District. 1937: A labor strike at Republic Steel results in the shooting deaths of ten workers. 1939: George Cardinal Mundelein passes away on October 2, 1939. 1942: Pressed Steel Car Company receives an award for their excellent job in producing tanks on September 10. 1946: Wolf Lake State Conservation Park is dedicated on October 13. 1952: Ground is broken for the parish youth center (St. Florian Gymnasium) in March. 1954: The new St. Florian Gymnasium is dedicated by Samuel Cardinal Stritch on June 6. 1955: St. Florian celebrates its 50th anniversary on July 10. 1955: Fr. Nowicki, former pastor of St. Florian, passes away on September 6. 1956: Pressed Steel is bought by U. S. Steel. 1963: On May 12, 1963, Fr. Kulinski celebrates his 50th Anniversary in the priesthood and his 30th as pastor of St. Florian Parish. Fr. Kulinski passes away on November 5, 1963. 1963: Father Chester Konsowski is appointed pastor of St. Florian on December 8, 1963. 1964: On April 8th a fire guts the sacristy of St. Florian Church causing $10,000 in damages. 1965: On February 7, ground is broken for a new school and convent to replace the aging structure currently in use by St. Florian Parish. 1966: St. Florian’s new school building opens its doors to students. 1966: Richard Speck commits the second “crime of the century” killing eight student nurses from South Chicago Community Hospital on July 14, 1966. 1970: Virgil I. Grissom Elementary School opens. 1974: Father Konsowski passes away on February 3, 1974. 1974: On February 13, Father Joseph J. Pachorek is appointed pastor of St. Florian. 1976: Mayor Richard J. Daley dedicates a new gymnasium at Mann Park on the morning of December 20. Later that evening he suffers a fatal heart attack and dies in his office at the age of 74. 1979: The formal process for the Beatification of Mother M. Theresa Dudzik, O.S.F, founder of the Franciscan Sisters of Chicago, begins on September 8. 1980: St. Florian celebrates its 75th anniversary. 1983: New passenger cars completely replace the orange and maroon South Shore trains. 1989: The Chicago South Shore and South Bend Railroad files for bankruptcy. 1989: The last Franciscan Sisters of Chicago leave St. Florian Parish with the graduation of the class of 1989. 1990: In February of 1990, Mayor Daley proposes Lake Calumet Airport, which would wipe out the neighborhood of Hegewisch. The proposal fails. 1990: The Northern Indiana Commuter Transportation District takes over the passenger side of CSS&SB railroad, becoming the South Shore Line. The freight portion becomes known as South Shore Freight. 1992: Father Pachorek retires as pastor of St. Florian Parish. 1992: Father Al Pizza is appointed pastor of St. Florian Parish on March 4, 1992. 1992: On June 4, Cardinal Bernardin celebrates Mass at St. Florian Church. 1992: The new South Shore station and additional parking lot is built in Hegewisch. 1996: Fr. Casmir Szatkowski becomes Parish Administrator of St. Florian. 1999: On November 28, on the First Sunday of Advent, St. Florian celebrates its first Mass in Spanish. 2001: Father James Mezydlo become pastor of St. Florian. 2002: Father Jim celebrates the 25th anniversary of his ordination on May 10, 2002. 2002: From October 27 until November 9, St. Florian Parish is honored to host Our Lady of the New Millennium. 2004: In May 2004, St. Florian has a Picnickel, an indoor picnic, celebrating the 100th anniversary of the Hot Dog and Ice Cream. All items are sold for just a nickel! 2004: The St. Florian courtyard play lot is dedicated on October 2. 2005: On March 7, The Illinois Department of Natural Resources partners with the City of Chicago to purchase 102 acres at Hegewisch marsh. 2005: October 2, St. Florian Way is dedicated on the 100th Anniversary of the founding of St. Florian Parish. The sign is posted at 131st St. and Houston Avenue. It includes Houston Ave. between 131st St. and 132nd St.
2005: November 5, St. Florian parish celebrates its 100th year. Francis Cardinal George presides over the concelebrated Mass with Bishop Perry, Fr. Jim Mezydlo and invited clergy. 2007: November 17, St. Florian School celebrates its 100th year. 2011: November 27, with the First Sunday of Advent, we begin celebrating the Mass with the Third Edition of the Roman Missal. 2012: June 24, Fr. Jim Celebrates his last Mass at St Florian. He leaves to become Pastor at St. Walter's in Blue Island. 2012: July 1, Fr. Robert Marchwiany becomes the 9th Pastor in St. Florian's History. 2012: September 23, St Florian Parish celebrates the Installation Mass for Fr. Robert at 11:30 a.m.; the Most Rev. Jospeh N. Perry, presiding. 2016: June, After over a Centruy of providing faith based education to the commmunity of Hegewisch, St Florian School parents come to the difficult decision to close the school. This difficult decision was based on dwindling enrollement due to the the declining population in the Hegewisch neighborhood.